Art has always been a wonderful way for people to express their creativity and their feelings through story telling. 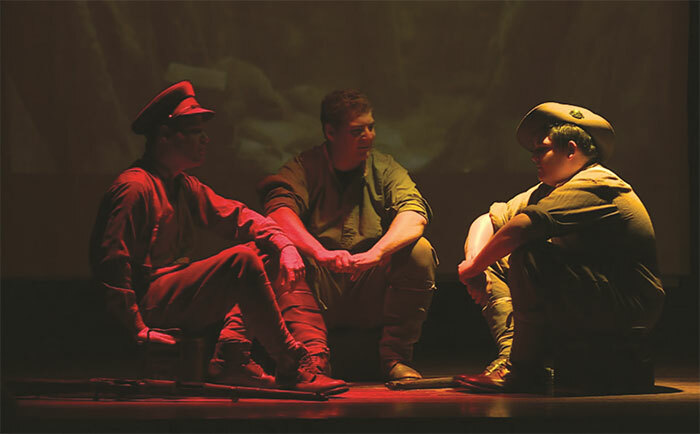 In 2015, amateur actor and former soldier Matthew Head performed the lead role in the musical production The Toast is Anzac, Gentlemen, presented by the North Queensland Music Association's (NQMA) Voices Choral Group (Bribie Island chapter). 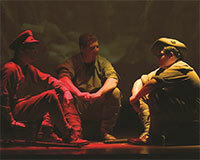 The production told the story of a young soldier, Jack Hawkins, who grew up in Kilcoy in Central Queensland, leaving his hometown to join the Australian Army in his early 20s. Jenda Jacobs, President of NQMA's Voices Choral Group described the musical as a retrospective of Jack's life, which tells of his army life, including the post-traumatic stress disorder (PTSD) he suffered as the result of his call to duty. "Matthew was already well aware of the pain caused by PTSD, having personally suffered the disorder since his own service in war," Ms Jacobs said. The play is set in three stages—a young vibrant Jack at home, a man learning to adjust to war, and an older Jack living alone in an aged care facility. Ms Jacobs said the play looks through the eyes of each stage of Jack's life, exploring the perspective of a time when boys went to war. "It included his enlistment, embarkation, life at Anzac Cove and his homecoming and resettlement," she said. "The play involved close collaboration between the writers and actors, and included choral workshops where the entire team participated in detailed research into the period to bring their material to life in the theatre. This included using confronting real life First World War video scenes provided by the Australian War Memorial in Canberra." In an emotive portrayal of one man's struggle, the local community of Bribie Island joined to commemorate the Anzac Centenary and tell the story of the Hawkins family. Community actors came from all walks of life to be part of the production. They included veteran Navy, Army and Air Force soldiers from Vietnam, the Second World War and the Korean War, who all shared their voice and experience. Together with support from the Queensland Anzac Centenary Community grants program, Jack Hawkin's legacy has been honoured and his life captured for posterity.